Last week my vegan pancakes with heart-shaped banana slices was blogged over on Vegan Breakfast. I’m officially in love with that blog. I normally make a quick bowl of Almond Milk and Corn Flakes or skip breakfast entirely and move on to lunch, but that blog gives me inspiration to try harder. 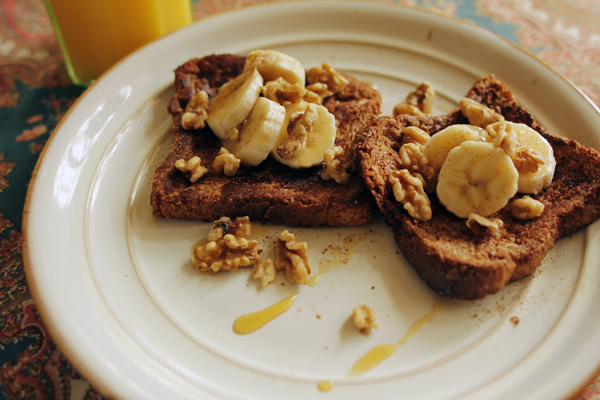 So, I did and made Peanut Butter French Toast with Walnuts and Bananas. Mix the almond milk, peanut butter, cinnamon, agave and salt together in a medium bowl. The bowl should be large enough for the bread to lay flat. Heat the olive oil to medium in a skillet pan large enough for all four bread slices. Gently dip each bread slice into the mix, coating both sides. Allow the bread to drip off excess batter, so they are not too soggy. Place the slices in a pan and cook each side till golden brown. I flipped the toast over a few times until they were nice and crisp. Top with walnut pieces, banana slices and agave or maple syrup. Enjoy!